What’s the deal with River’s genius/ craziness/ aptitude for slaughtering people? What’s Shepherd Book’s deal? What kind of holy-man can fight, shoot, and get priority medical attention from the Alliance? The movie Serenity answered the questions about River, and tied a nice bow on the series. 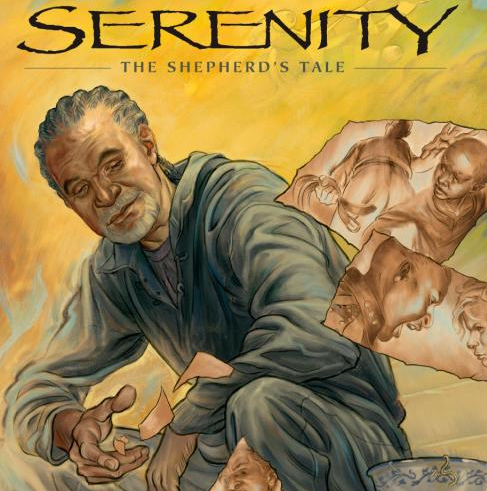 The new graphic novel, Serenity: The Shepherd’s Tale take you on a journey through Book’s past. The script is tight, the art is expressive, and the characters are on-point. The story was plotted by Firefly creator Joss Whedon, and the script was written by his brother Zack. Zack nailed the characters. Each of the original crew members have a few lines of dialoge (except for Inara). Chris Samnee’s art is excellent for this story. I can’t imagine his style working for any other Serenity story, but in this instance it’s spot-on. Book’s tale is compelling, entertaining, and carefully answers all of the questions the series raised without being too on-the-nose. It’s short. Really really short for the $15.00 cover price. I took my time reading and taking-in the art, and it was still a quick read. This story is completely meaningless unless you are a Browncoat. If you don’t know what a Browncoat is, you aren’t one. If you love the Verse, this is story is well worth reading. Support your local comic shop, or be lazy and order from Amazon. alright, another Browncoat!! I highly enjoyed Shepherd’s Tale, but would have included the artwork under “the bad”. the shortness wasn’t as big a deal for me, I knew it was going to be really short. . . but the style choices of the artwork was a let down. the artwork couldn’t have been much of a problem, I still happily forked over $15 for it! The only place I found the artwork a little troubling was on the Serenity. The art didn’t handle multiple characters well. However, when Book was the the main focus I enjoyed it. Always nice meeting another Browncoat. Redhead, I’ve put a lot of thought into this and I think the reason why the characters who aren’t Book lack facial detail is because the art represents his memory. When thinking back to an earlier time in your life, do you remember facial details? I can’t. I have a hard time remembering the detailed features of other’s faces after a few days. The further back it goes, the blurrier the faces get in my memory. I could be over-thinking the artist’s intent, but that’s my theory. After thinking about the story and how it aligns with the series/movie, I realized that this comic book contains a MAJOR plot hole: Book’s discharge. The Alliance officer tries to kill him and Book is stripped of rank. How then is he able to get medical treatment with no questions asked? If he was dishonorable discharged, then they would probably refuse treatment, investigate Serenity, and possibly arrest the crew. Alex – You raise a fair point. I’m sure there is a way to rationalize it as this is fiction. Nevertheless his unceremonious discharge would suggest a poor relationship with the Alliance that is not reflected in the show. Do we know he was dishonourably discharged? Yeah his superior was pissed as all get-out, but technically could it have been an “honourable discharge” from the military’s POV? Also, does it matter in terms of veteran benefits? If someone is dishonourably discharged from the Afghanistan war, do they lose all veteran benefits? I honestly don’t know, but I wouldn’t be surprised if they still had their benefits like VA hospitals etc, after all, they are still a veteran. As far as the story is concerned, I don’t recall ever seeing legal justice in action in the Verse, so there is no standard by which to measure. I guess you can presume there was no trial for Book, so there might be no record of his dismissal from military service. It still seems like a plot inconsistency to me.